Also see Elite Dragon Slayer, Golden Dragonslayer, and Golden Dragonslayer Eclipse. 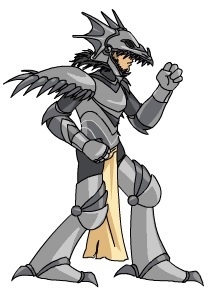 This is the official armor of the Order of Dragonslayers. 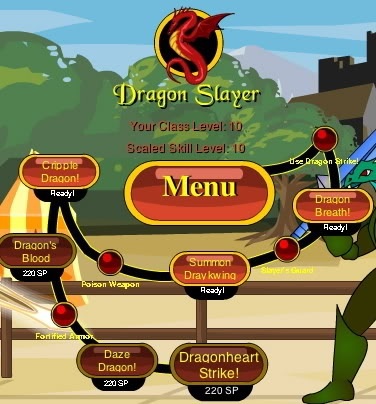 Equip this armor to use the skills of the Dragonslayer class! *Your Combat Defences increase by 0.6727*C, rounded normally. ***On Monster Category "Dragon", they decrease by (C*0.25 + 1.5)% each, rounded normally. On Monster Category "Dragon", all Player Attacks, Spells, and Specials deal 120% Base, Random, and Stats damage. On Monster Category "Dragonkin" or "Drakel", all Player Attacks, Spells, and Specials deal 105% Base, Random, and Stats damage. Your Dragonslayer training has taught you how to strike true and deep especially against Dragons! Each round of the effort takes «» SP. Damage: (160 + E*4.8)% Base and Random, and (160 + E*7.04)% Stats. Against Monster Category "Dragon", this deals 110% Base, Random, and Stats damage. Against Monster Category "Dragonkin" or "Drakel", this deals 100% Base, Random, and Stats damage. You channel the power fo the dragons you have defeated to strike your foe's with a blast of dragon's breath! Against dragons it strikes the weakest element! Call a loyal fire drayk to fight by your side! He must have megdragon blood as his breath can deal nonelemental damage to Dragons! Summons Draykwing as a Guest. Cast again to dismiss him. Coat your weapon with a homemade dragonbane poison! It costs «» SP per round to keep the blade coated. While active, you pay Round(Round(38.1 + 2.3375 *E + 0.01125*E^2)* 0.22265625) SP whenever you perform a Normal Attack. If you cannot pay, the rest of the effect is not applied. The level of the poison is equal to E plus +20 (against Monster Category "Dragon") or +10 (against Monster Category "Dragonkin" or "Drakel) or -10 (against anything else). You know just where to strike a dragon for maximum effect, weakening it! You perform a Normal Attack. If the attack connects and deals non-zero damage, then the monster is Crippled. The level of the Cripple is equal to (7.5 + S) rounded down, multiplied by 1.2 (against Monster Category "Dragon") or 1.1 (against Monster Category "Dragonkin" or "Drakel") or 0.9 (against anything else). You can tap into the powerful blood flowing through a dragon's veins in order to heal your own wounds! Attacking a draconic foe's head when it comes close enough to strike, you weaken its mental reserves! *Against Monster Category "Dragon", the Element is Fire, Harm, or Void, to whichever the monster is weakest. Against anything else, the Element is Fire or Harm, to whichever the monster is weakest. If the Element is Void, then the damage is doubled. The fourth hit deals (850/37)% Base, Random, and Stat damage, and Cripples the opponent as in Cripple Dragon. New price and Level from Hush. Skills from vezha, Genoclysm, Ash The Phantom, and Sagecallon. Numbers from Kalanyr (via Ash The Phantom and Sora Aeragorn). Corrections from rsberzerker and Azami. Typo correction thanks to Dwelling Dragonlord. The armor of DragonSlayers. Purchase this armor only if you want to go on the Dragonslayer class quest. Unleas the magical fire breath of Dragons from your fingertips. Strike your Dragon-kind opponent and steal 50% of the damage dealt to increase your health! You gain 50% of the damage you do with this attack. Summon the loyal Draykwing to fight by your side. Cast the spell again to release him. He breathes fire that will even hurt fire dragons! 90 Turn charge, starts at 60. Trigger: The element becomes Element X on Monster Name "dragon", "drakel", drakle", "lizard", "akriloth" or "velociraider"
Thanks to Z.324 for added info on Dragon Fire. New location from Lifeless89 and Ultra Zorbak. Sellback from Reign Man. Image from Artix (via Eternal Chaos). Skill tree from Teuvi and Sora Aeragorn. Charge from ~Cin~.